5 And the man Micah had a shrine, and he made an ephod and household gods, and ordained one of his sons, who became his priest. 6 In those days there was no king in Israel. Everyone did what was right in his own eyes. 7 Now there was a young man of Bethlehem in Judah, of the family of Judah, who was a Levite, and he sojourned there…. 10 And Micah said to him, “Stay with me, and be to me a father and a priest, and I will give you ten pieces of silver a year and a suit of clothes and your living.” And the Levite went in. Even in the era of the judges, people who did as they pleased were simultaneously acting out God’s perfect will, as seen in remarks that Samson’s pursuit of a Philistine wife “was from the Lord” (Jg 14:4) and that Eli’s evil sons ignored their father’s admonition because “it was the will of the LORD to put them to death” (1 Sam 2:25). Nevertheless, the Israelite were particularly compassless and unstable without an earthly king. They asked God for a King “to judge us like all the nations” (1 Sam 8:20). God warned them that they were rejecting the Lord as king and that the king they sought would take their land and bind them in servitude. Alas, the kings of Israel and Judah often acted with varying combinations of faithlessness, idolatry, petulance, tyranny, cowardice, and ineptitude; their subjects were no better. The people eventually came under external control. With this backdrop, God sent his Son to be born in Bethlehem as a King without fault, yet one who claims of us not merely the property with which he has entrusted us but also our hearts. “We take captive every thought to make it obedient to Christ” (2 Co 10:5). In fact, Jesus commanded us to be perfect (Mt 5:48). And “we must all appear before the judgment seat of Christ” (1 Co 5:10). But thanks be to God that his King provides what his law requires. “He has delivered us from the domain of darkness and transferred us to the kingdom of his beloved Son” (Col 1:13). He strengthens us and has sent his Spirit to guide us in obedience. And when we inevitably and repeatedly fail in spite of that, it is his sacrificial work alone that can make us right with God. We cannot and need not compensate him the way Micah paid the Levite from Bethlehem. Jesus informed Pilate (and Jesus’ mistaken disciples) that his kingdom was not of this world. But we know that in a day to come, he will return with power, and every knee will bow to Him, the King of kings and Lord of lords. “Therefore let us be grateful for receiving a kingdom that cannot be shaken” (Heb 12:28). Let us worship Christ, the newborn King! 17 Learn to do right; seek justice. In Isaiah’s vision given by the Lord we are given a picture of Israel’s rebellion and corruption right from the beginning which brings God’s judgment, declaring that his people were like Sodom and Gomorrah. All the sacrifices and religious ritual were empty practices. Then God’s mercy is revealed. Lets talk about this , says the Lord. Though your sins be as scarlet they shall be as white as snow, if you are willing and obedient. Scarlet is a very vibrant color. As an artist, I very seldom use this color for that reason. In Ohio, where I was born and raised, we had a great deal of fog. Driving in the fog was very difficult. One time I just followed the scarlet tail lights of a semi. They were visible through the fog. Israel’s sins were clearly visible to God through their attempt to fog God off with their pious practices. God is a God of mercy and love and grace: I will make your sins as white as snow. God didn’t reveal how this would happen until it is declared in the vision in Isaiah 53. There we see one who is stricken by God, pierced for our transgressions, crushed for our iniquities. The punishment that brought us the white snow of peace was upon him. This vision is, of course, of the Messiah, the Lord Jesus Christ. He came to live among us. As Christians, we encourage each other to put the brakes on the runaway train of stress, rushing, and commercialism that threaten to consume Christmas. We long to step out of the hustle and bustle of activity, to slow down and savor the season of advent. To focus on Jesus. And yes. Yes. That is right and that is good. I imagine what that might look like… a family with clean and tidy children doing whimsical and artistic things. Having a gentle and holy Christmas. Sitting quietly in candlelight, probably with the children in matching pajamas, watching snow falling gently outside the windows, singing Christmas carols. Sharing their homemade gifts with each other. And eating… I don’t know… organic fruit. While at my house – especially when the boys were younger – anticipation and adrenaline were high, voices were loud and excited, gifts came from the store in boxes that said “Lego” or “Nerf”, Christmas photos sometimes require “persuasion”, and hands, faces and floors were usually… sticky. Not exactly the tender and hallowed image I’d conjured up. And you know what? The first Christmas wasn’t exactly a pinterest-worthy photo-shoot either. Mary was hugely pregnant. They had the worst vacation EVER (probably 90 miles on a donkey, and no reservation at the Holiday Inn waiting at the other end). She delivered her baby in a dark, cold, smelly barn. And then, in all the mess, unexpected guests! And the Word became flesh and made His dwelling among us. Can you feel the relief? He understands. He’s one of us. So at Christmas we celebrate the spiritual AND the material. At our house, we sing O Come All Ye Faithful and we giggle at Alvin and the Chipmunks’ rendition of Christmas Don’t Be Late. We make a nativity scene out of Legos, with Mary and Joseph and the angel guarding them played by Star Wars characters. Bob the Builder and his heavy equipment come to visit the stable. We decorate our tree. And our house. And the porch. And the yard. And we make ridiculous amounts of cookies and candy. We blend the spiritual and the physical. And we wish you all a joyful, loud, worshipful, merry, sticky-hands-on Christmas. After opening the small collection of presents beneath our tree, Dad announced that there was one more for all of us to share. In those days many of our presents came in boxes from kind aunts or faraway friends: useful and edible gifts like socks, a box of chocolates, or a can of popcorn. But Dad said this last gift was from him and Mom. It was too big to wrap so he would have to go and get it. I was only five, but how well I remember that moment now so many years later–the dimly lit room, the shining tree, and the excitement of anticipation. In a few minutes Dad came back with the best thing we could have ever imagined: a toboggan! It was taller than Dad, with its long, beautifully polished, honey-colored wood curling at the top–the perfect sled for all of us five children to ride on at once. At the time we lived in northern British Columbia and the snow was deep all winter. We rushed into our warm things and then outside where Dad pulled us behind the Jeep Wagoneer up and down our driveway all that magical Christmas Eve. The next morning my mom backed over the toboggan because it had been left behind the car. It was completely crushed, and so were we. There was no money to replace it. So that was that. My children never like hearing this story –“it’s so sad!” But as an adult, as a parent myself with the responsibility of preparing gifts for my children, this memory is one I cherish. It is a picture to me of the gifts the Lord plans for his children and the delight he takes in our joy. And it reminds me of this truth which we are taught every year: all the presents we give and receive at Christmastime eventually break, grow old, or lose their power to delight. But God’s perfect gift, planned from ancient times, orchestrated with perfect care, and revealed at just the right time, never breaks or grows old. That gift is Jesus. 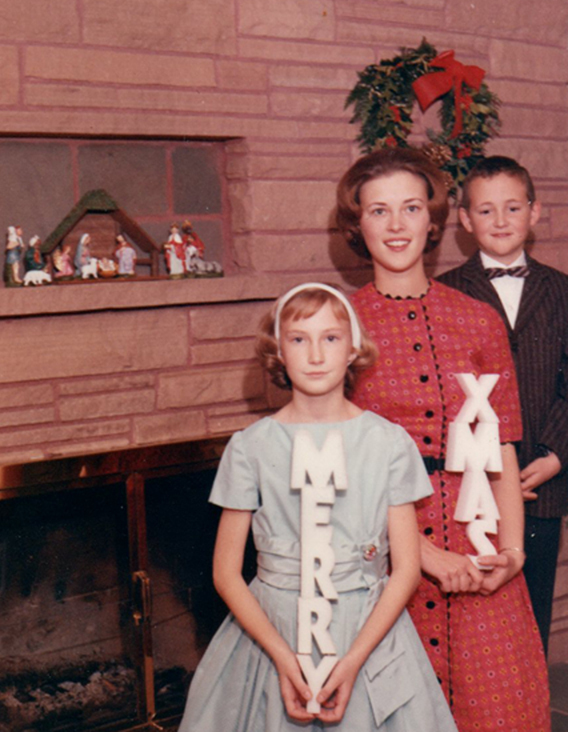 In December 1963, it was considered questionable taste to use styrofoam letters toothpicked together to spell out “Merry Xmas” in a family Christmas picture for our family Christmas cards. Why the X? Because we couldn’t get the whole word “Christmas” to hold together without collapsing into a mess of vowels and consonants. We certainly tried. So my dad made a special run back to the crafts store to buy an X so we could get this picture done while his three children were still spit combed, and polished clean. I vaguely remember my mother being a bit reluctant to use the abbreviation “X” to represent “Christ” in Christmas, as she thought it might offend a relative or two as possibly disrespectful, but we did send a copy of this picture out to the 100+ people on her list, and I don’t recall any fall out. It turns out there is good reason for the traditional “X” in XMAS, and it is not to make Christmas advertising more compact, using less expensive space. 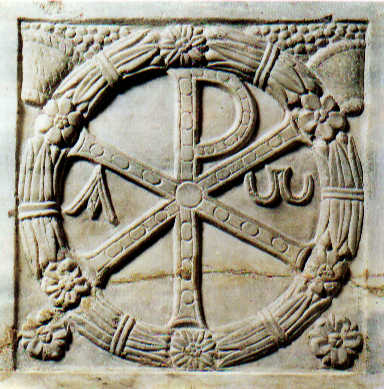 It represents the first letter Chi of the name Christ in the Greek alphabet (Χριστός) and was used as an abbreviation for Christ (sometimes as below in the symbol known as the labarum, in combination with the “P” that represents the Greek letter “Rho”). This was sometimes a secret communication device between Christians, and often displayed overtly in worship settings. So the X is, in fact, a name for Christ, in shorthand. There is no disrespect meant, but rather a way that religious community members could easily find each other in sometimes oppressive circumstances. Now, 52 years after this photo was taken, it’s the styrofoam that causes offense, knowing it will never break down in landfills, and simply can’t be destroyed without inflicting environmental damage. But the X representing Christ is here to stay. It may offend those who do not acknowledge the reality of God who walked the earth, dying in our place, broken in body only. His truth and spirit rose again and cannot and will not ever be destroyed. The Bible doesn’t have much to say about Nazareth. Historians make little or no mention of it. Apart from the prophecy that Christ would come from Nazareth, and Philip’s contemptuous reference to the town (John 1:46), we know scarcely a thing about the place. So why does God make mention of it? It may be that this was the whole point. To say, “He will be called a Nazarene” is perhaps the prophet’s means of informing those in waiting that Christ’s coming would not seem extraordinary; he was to come from a place that would seem insignificant, not elite, too common to be notable. Why should it matter that Jesus was a Nazarene? 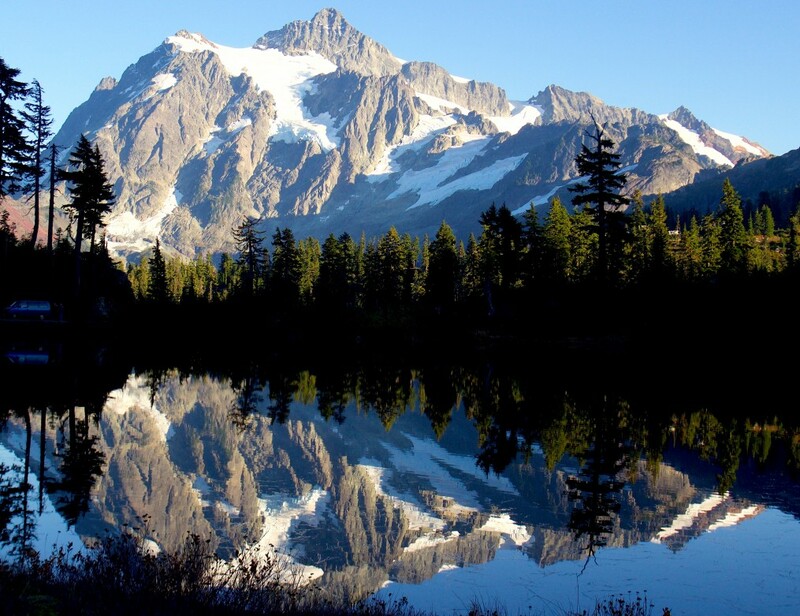 It is a cue to God’s character, a reminder to pay attention, because our maker doesn’t work with all the fanfare and shows of power we might expect. He is a God who emerges from and makes his dwelling within the insignificant forgotten places, in broken hearts and places of intellectual, financial, and relational impoverishment. He is at work in the places and people we revile. No place on this earth was worthy of Jesus. And he chose to become our Nazarene, to make it unmistakable that he will come to any place—none too dark—for he came to ransom captives from every nation, city, and forgettable town. The trumpet shall sound, and the dead shall be raised incorruptible, and we shall be changed. As we sing through Handel’s Messiah each year, this piece above all others, gives me the shivers. The good shivers. I hear the piercing trumpet, and then the bass begins to sing the powerful words. We – the dead, the corrupt, the mortal, broken and sinful – will be changed. I can identify with Isaiah, in chapter six, when he sees the Lord, high and exalted, being worshiped by the angels. His response is along the lines of, “Woe to me! I’m doomed! I am unclean, and I have seen the King, the Lord of Hosts!” But with a coal from the altar, his guilt is removed and his sin atoned for. I know the word “corruptible” in the verses speaks of our mortality, but doesn’t it also speak of our sinfulness? Our susceptibility to corruption from within and without? I feel it every day. Yet, comes the promise – We shall be changed. Transformed.